More than two thousand years old, the Chinese pipa is a 4-stringed lute, reputed to be technically difficult. As early as the HAN Dynasty (206 BC-220 AD) the pipa was appreciated in Court music. 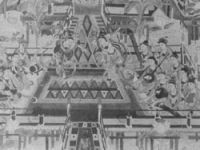 During the SUI Dynasty (581-618 AD) the iranian luth came to China and was mixed with the chinese pipa. During the TANG Dynasty (618-907 AD) it became a solo instrument, and then later in the MING (1368-1644 AD) and QING (1644-1911 AD) Dynasties it entered the orchestras that accompanied opera performances. Its strong and resonant sound gives to the pipa a broad and noble flavour. 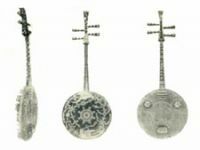 Nowadays in China, the pipa is one of the favourite classical instruments. 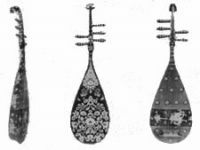 The Pipa’s rich diversity of sound allows it to depict a large range of musical expressions. Its repertoire is mainly divided into two styles: the WEN style, a lyrical style, characterized by a subtle play and the WU style, a martial style, whose strength inspires dramatic emotions.